This cooler, wetter summer has been great for my veggie patch. 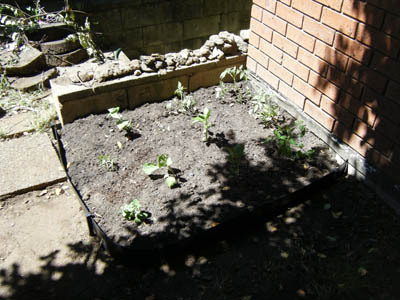 You’ll recall that we planted seedlings in October, which were coming along nicely in November. Now? It’s like a jungle out there. The tomatoes are just going crazy. I’ve had to restake them several times, and they’re now spilling out over the back wall into the stairwell. They’re laden with green fruit, both shiny cherry sized and big juicy ones. 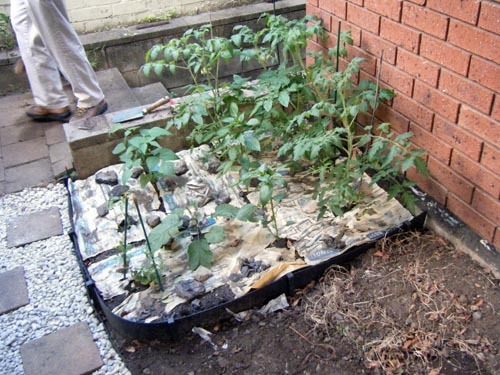 We’re going to have so many tomatoes… I think I may need to learn to can. Eggplant! My eggplant plant has produced loads of pretty purple flowers, but so far no actual fruit. I wonder if birds are eating them or something. Or maybe it just wasn’t old enough? At any rate, it’s big and hearty now so hopefully we’ll eventually get fruit. Beans! My little bean plant has so far provided the only harvests. I’ve taken about a dozen beans off it and it’s got plenty more tiny slender ones growing. The herbs have been a constant battle against the scourge of caterpillars. Our basil got hit hard and is just now starting to recover. (Natural selection at work: we easily picked off all the brown caterpillars but couldn’t figure out why they were still getting eaten. Closer inspection showed a number of little green caterpillars happily munching away. Bastards.) The mint and the cat grass are doing well. Lemons! After a couple seasons with little fruit, our lemon tree is thriving again. We repotted it last year into a much bigger container, and I think that’s made it happy. It’s covered in little green lemons right now. And lastly, the PUMPKINS. This is what they looked like six weeks ago. Remember how Frances warned me that pumpkins like to take over the garden? Look at this. A cascade of pumpkin leaves! The pumpkin patch has been extended about eight feet! And I’m happy to report that it’s a very sincere pumpkin patch, with not a bit of hypocrisy. The vines have completely wound in amongst the existing plants along the side of the fence. (A friend warned that they might strangle the other plants, but I don’t mind. I think they look rather lush and pretty.) If you lift the leaves and spy underneath, you can see the whole network of beautiful delicate green tendrils supporting the whole structure. There aren’t any blossoms yet though, and I’m a little worried about how many pumpkins we’re going to end up with. Also, those vines are climbin’. How does a pumpkin grow three feet off the ground?? 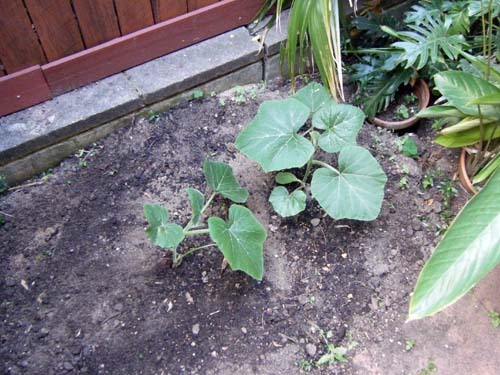 We have taken note of a very successful pumpkin vine in Dulwich Hill. Some apartments on marrickville Road just near the shop have used a fairly strong lattice frame (2 Sides and top) to support their pumpkin vine and guide it away from the rest of the vege patch. It always loooks lucious and our one attempt at pumpkins did well at the old place using the same structure.